All ceramic crowns are translucent and made of natural looking materials like veneers. Crowns can provide greater durability and block dark stains better, where veneers are less of an option. With today’s advances in cosmetic techniques, ceramic crowns don’t have the unattractive dark lines at the gum line. If your front teeth are severely worn from grinding, extremely dark, or have large fillings… All Ceramic Crowns would be the best choice for a smile makeover. Ceramic crowns are protective covers that rebuild and preserve your teeth with strength and natural beauty. We are proud to be teamed with a world class laboratory, located here in Tallahassee. Ultimately what shows when you smile is the porcelain that the laboratory has fabricated, and our lab technicians and are true artists. These remarkable materials are crafted with the precise shape, color, and texture determined by Dr. Savardi and Dr. DeLopez, and then bonded to the tooth structure for long-lasting beauty. They are created to reflect light just as your natural teeth would, and enhance your smile. All of our esthetic crowns, veneers and bridges are personally crafted by our local laboratory. This unique relationship with expert lab technicians assures our patients the highest quality in custom crown restorations. If you want one-of-a-kind world class ceramic restorations, we are the office for you. Review the cases here on our web site, visit the Florida Academy of Cosmetic Dentistry’s 2008 Smile Gallery Competition winners web page, and contact our team about your personal dental goals. 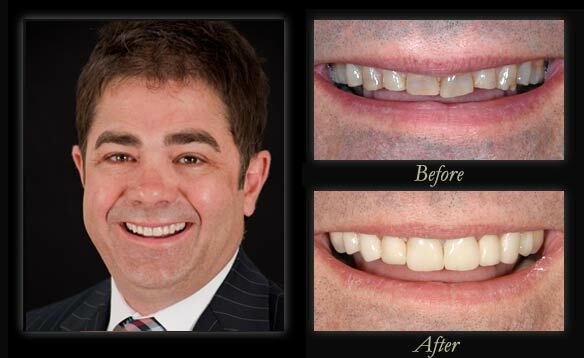 Ten ceramic crowns and 4 porcelain to gold crowns were required to restore this businessman's smile.